Aroma – Rum and raisins, brazil nut, toffee, chocolate, cherries. With water added, lavender, toffee, and cappuccino. Taste – Milk chocolate, ganache, cappuccino, gentle smoke and orange oil. Finish – Complex, orange oil, mature, bacon, pork. These are words from the Ardbeg rep, I did not get all of them but wouldn’t contradict them. What I do remember about this product was the orange oil. It was really nice, really warm and very rounded. From what I gathered, you can own two bottles of 1974 along with a bespoke leather gun case, price, I think was around $16,000 (US). If you want some, I’m sure Ardbeg will be happy to talk to you! If you don’t know how to get ahold of them go to their website. 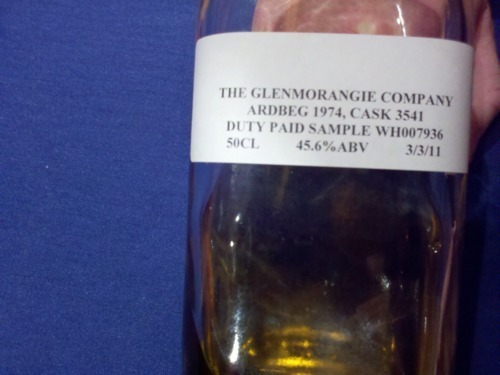 The Ardbeg story is interesting and its great to know that this distillery was in fact rescued (ultimately) by Glenmorangie. Although Ardbeg is working, production wise, from product produced after being resurrected around 1990, they are working miracles and winning fans (not to mention awards) with the guidance and expertise of Bill Lumsden and David Blackmore. I have tasting notes for five other Ardbeg’s that I tasted and will share them soon. I personally have the Corryvreckan and have a bottle of the “Beist” on the way that I am very excited about. This is a product that I intend to own as many of the offerings that I can. The 1974…… In time.